You can use the device across the whole country, so bring it with you as you travel around! While in Busan, don't miss out on Busan Tower and Busan East Coast Cultural Day Tour! Very good value for money. Not our first time using and will definitely use again. Good speed and good coverage. Staying connected and sharing with friends and family has never been easier, especially when you can just pick up a portable WiFi device that allows you to access 4G data while traveling in South Korea! 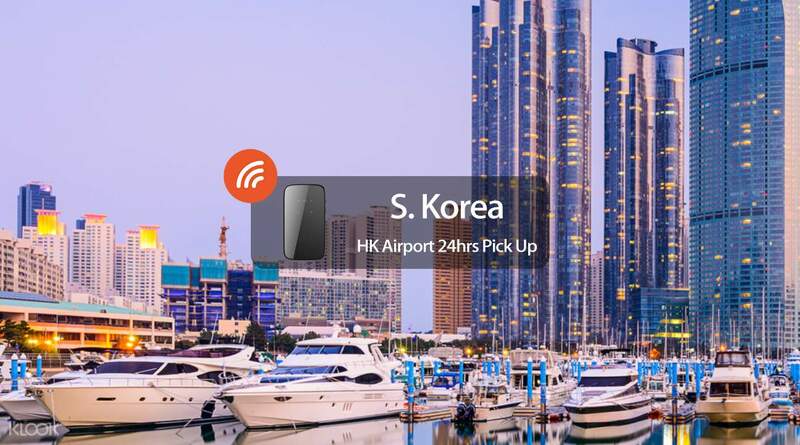 Simply pick up your device at Hong Kong International Airport. You'll be sure you'll have internet connection before you even land in South Korea, so by the time you get there, you're ready to explore this hustling and bustling destination. No more worrying about internet for googling locations, opening up maps online, or even Klooking your activities! Grab this portable pocket WiFi device and get started on South Korean adventures! Getting the WiFi egg is super fast in the airport counter at midnight. It is double the size of the Uroaming one but its battery can last for the whole day while its competitor lasts only 5 hours. I don’t need to recharge it at all (one person using only). Also connection is strong even in a non-touristy city (Pohang, South Korea). Never needs rebooting unlike another wiFi egg I had used before in Japan. Getting the WiFi egg is super fast in the airport counter at midnight. It is double the size of the Uroaming one but its battery can last for the whole day while its competitor lasts only 5 hours. I don’t need to recharge it at all (one person using only). Also connection is strong even in a non-touristy city (Pohang, South Korea). Never needs rebooting unlike another wiFi egg I had used before in Japan. Love that it has the 24 hours services so I can pick it up and drop it off for my midnight flight. The battery life is long! We were sharing the wifi egg among 3 persons and the battery still last till the end of the day! The wifi itself is also stable and fast. Would definitely recommend it! Love that it has the 24 hours services so I can pick it up and drop it off for my midnight flight. The battery life is long! We were sharing the wifi egg among 3 persons and the battery still last till the end of the day! The wifi itself is also stable and fast. Would definitely recommend it! WifiBB is very convenient! It is open 24 hours a day so even if you have a midnight plane, if time allows you don't have to pay for an extra day ahead! Also quality is super! Thanks to Klook with a reasonable price per day! WifiBB is very convenient! It is open 24 hours a day so even if you have a midnight plane, if time allows you don't have to pay for an extra day ahead! Also quality is super! Thanks to Klook with a reasonable price per day! Super good deal to book with Klook app, even better to book with WiFi BB app. Good battery life with high quality of speed. Super good deal to book with Klook app, even better to book with WiFi BB app. Good battery life with high quality of speed. Stable connection, value for money, easy accessible, and battery durable. Highly recommended. Stable connection, value for money, easy accessible, and battery durable. Highly recommended. Stable connection, value for money, easy accessible, and battery durable. Highly recommended. Stable connection, value for money, easy accessible, and battery durable. Highly recommended. Did not picked this up because I booked wrongly. But I’ve used their WiFi for Japan. It’s excellent and price is so much cheaper than any other. Wish I’m going from HK instead. Did not picked this up because I booked wrongly. But I’ve used their WiFi for Japan. It’s excellent and price is so much cheaper than any other. Wish I’m going from HK instead. Very efficient picking up process. Easy to use. Generally good signalling throughout the whole trip in Busan. The battery is very long-lasting, we just charged it twice in our 7-day trip. Very efficient picking up process. Easy to use. Generally good signalling throughout the whole trip in Busan. The battery is very long-lasting, we just charged it twice in our 7-day trip.